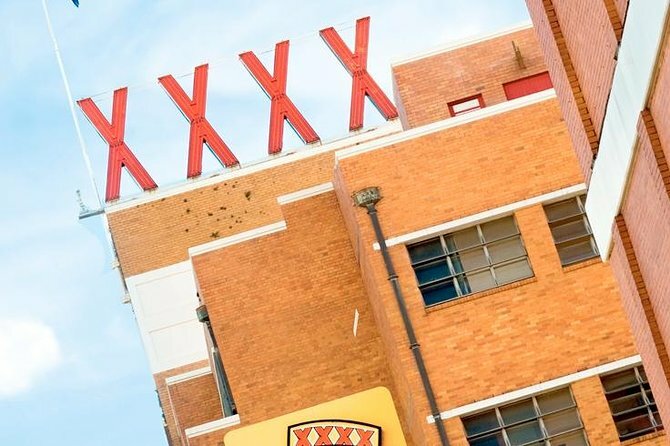 Take a guided tour of Queensland’s famous XXXX Brewery to learn about its history and sample some of its best beers. See the raw ingredients that make up the brews, and walk through the heart of the production area to see the process up close. Wrap up your tour by learning how to pour the perfect pint, then taste four of XXXX Brewery’s fresh beers. In Queensland, XXXX means beer, but how did this iconic brew get its name? Find out on a fun and fascinating 90-minute tour of the XXXX brewery. Your guide greets you in the brewery’s visitor center. Enjoy an introduction to the history of beer making, and learn some of the brewery's techniques. After your introduction, walk throughout the central parts of this historic site. Put on safety gear and check out the machinery that brews, stores and bottles beer. Most weekdays, you can enter the Packaging Hall to marvel at the state-of-the-art packaging line. Watch thousands of beer bottles whiz past you on a distribution line; most breweries don't allow you to get this close! Once you have delved into the inner workings of the brewery, get instruction on how to pour the perfect glass of beer in the XXXX Restaurant and Bar. Taste four freshly made brews with a new appreciation for the work that went into making the tasty beverage. After about an hour and a half your tour wraps up. Feel free to kick back in the bar and enjoy XXXX's legendary beers or visit the gift shop before making your way to your next destination. Tour is not recommended for children under 5 years old.